+ How old do you have to be to work here? You need to be at least 16 years old to work here. However, due to labor laws, you are not allowed to use the dough mixer unless you are 18 or older. + How many hours are available? The number of hours available varies by location and may also be affected by your availability. + How much is the starting pay? Pay rates vary based on your level of experience and availability. + How often do you get paid? Pay day is bi-weekly on Wednesday. + What positions are available? We have positions available as an Associate, shift leader, or manager, depending on the needs of the specific location. + Is there room for advancement? We have a strong promote from within culture. 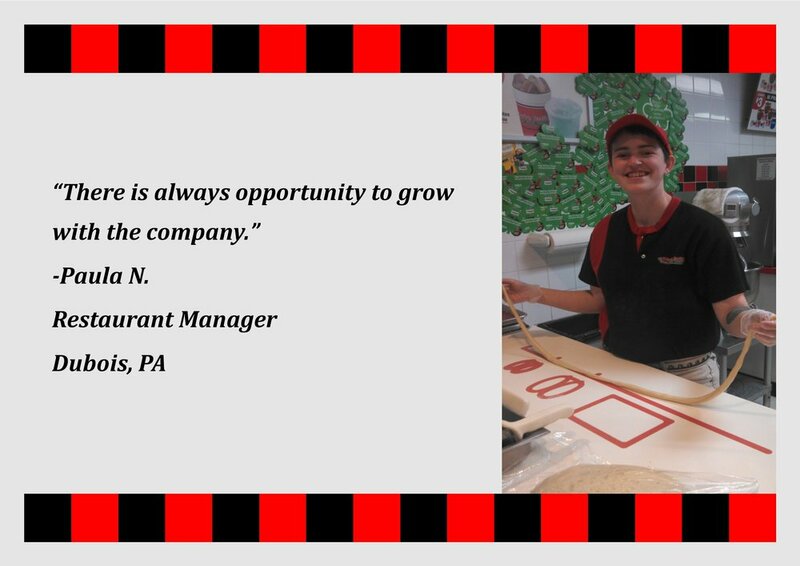 Most of our restaurant managers and all of the Restaurant Support Center Associates started their careers here as an Associate or shift leader. + Will i get a discount on food? Associates are eligible for a 50% discount on food purchased from your restaurant location. + Do you offer benefits? Associates who work an average of at least 30 hours per week and meet the other requirements for health insurance have the opportunity to participate in our group medical program. We provide uniform shirts and hats. You will need to provide black or khaki slacks. + Can i get hired if i have a felony? Having a prior felony conviction does not eliminate you from being employed here. We consider each application carefully and consider many pieces of information in making all hiring and promotion decisions. + Why are there so many questions on the application? We are very serious about hiring the best people to be Associates. The personality and attitude assessments that are included in the application process are a very important part of helping us to evaluate each application. + Do you offer any bonuses or incentives? We offer monthly sales bonuses with the potential to make up to $1 extra per hour. From time to time we run contests that allow you to earn extra money for selling certain items or meeting other objectives. + How soon will I hear from you after I apply? Applications are reviewed every day Monday through Friday. If we are interested in scheduling an interview or if we have questions about your application, you will receive a call from one of our Associates. *These policies apply to corporate locations. They may differ at franchise locations.